Good news for all Google Maps users. If you use it frequently and share lot of Google Maps URLs with your friends, you will rejoice over the new Google Maps Labs feature named ‘Short URLs’. You must have found Google Maps URLs too long to manage so far. It includes a lot of parameters. But now, Google has solved the problem with URL shortening service. This brand new feature dramatically shortens Maps URLs. The Maps URLs are hosted at goo.gl, the search engine’s official URL shortening service. Therefore, it works fast. Just navigate into Labs and enable ‘Short URL’. You will get short permalinks when you click “Link” at the right-top corner. To get the full permalink, you need to right-click on “Link” and copy the location. But, you will miss the embedding feature if you enable ‘Short URL’. 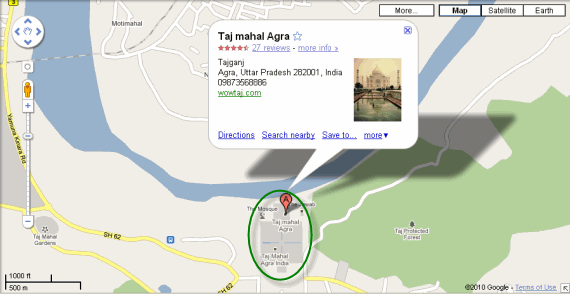 As an example, search for “Taj Mahal, Agra, Uttar Pradesh, India”. But now, you have the short permalink as http://goo.gl/maps/gt57 . The best utility of this service is that, you can tweet any Google Maps URL now. The call bttuon is now grayed out on the Droid Incredible. I rebooted the phone following the upgrade.